Do you wanna know why you need a Gmail Kanban? Well, we all know how messy our inboxes can get, right? Being able to organize them is not something we are everyday, and once it’s cluttered, goodbye productivity. Organizing Gmail is something much easier said than done. When you start actually doing it, you realize it can take much more time than expected. You see, not everything must be painful, but in order to achieve a decluttered and clean email, there are some steps to climb and mindsets to change, so let’s start it out. Emails came to the internet as an online version of mailboxes. They became very popular from the beginning of it as a rich form of interaction – in that time, when no other possible rich interaction existed. But when you think about that, even now with instant messaging and social media, emails are still very popular. Many other solutions have come and gone, but email has remained as a solid solution that integrates other solutions, acting like a digital hub for online identity. Well, as a cultural part of the internet experience, emails have a strong reputation and it doesn’t seem to be fading, just changing. Nowadays there are plenty of tools in which you can do mostly anything with your old pal, but at the same time you can’t just insert numerous tools at the same time, you must be wise and choose only what works best for you. If you have chosen Gmail as your email provider, thumbs up! ?It’s one of the best ones out there. BUT I’m sure we can make it much better, bear with me. First and foremost, you can only have an organized Inbox when it’s minimally cleaned up. If you’re starting from scratch and haven’t even done that, this article will be your best friend. The less time you spend on email, the more productive your work will get. Once you master these first steps, you’re completely ready — and less stressed out — to keep going. Not much more than that to be honest. You can set up a couple of rules and that’s it. Although these features are quite old, they’re still useful. Labels can be colored and it really makes email become visual. You can learn everything about it in this article. However, to increase and maximize productivity, we believe there is a Rockstar way to revolutionize your Gmail organization. You made it! If you read until here, you deserve to know how much better life becomes after Gmail Kanban. How do you do this transformation? With Drag! In 3 seconds your inbox gets Kanban — plus much more features — and you’re good to go! Drag seamlessly integrates to Gmail to turn your Inbox into a beautiful Kanban board, so there is no need to open another browser or tab. No need to open another email client. No need to open anything. It’s just there, in your old and good Inbox.
? 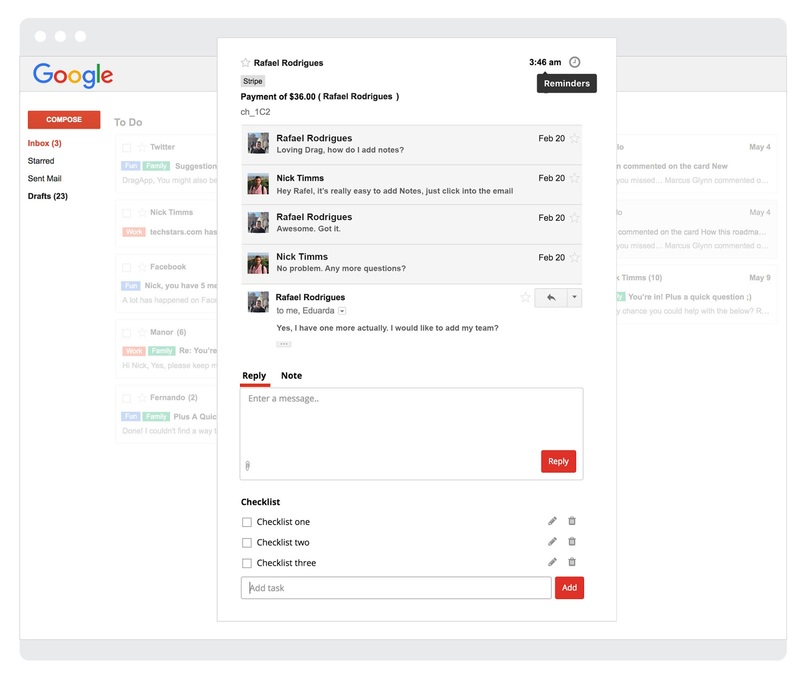 USE GMAIL KANBAN NOW ? 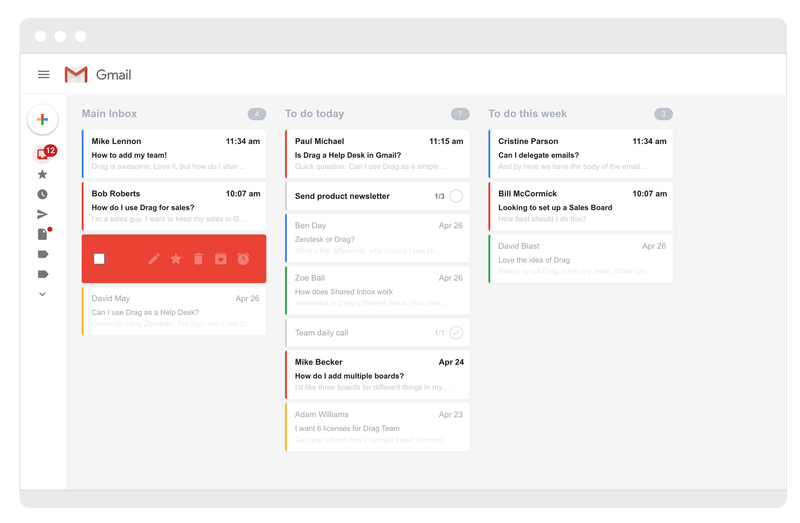 Both emails and tasks become cards, so you’re in just one place, able to do a lot more to manage emails, manage tasks, manage projects, CRM, Help Desk or whatever you want, really. By centralizing and visualizing everything, Drag reduces the amount of time you spend on managing your emails and on transitioning among different tools. The usual problem with adding tools is that you add different places to check on a daily basis for your work routine. Is it practical? Well, it’s better than nothing, indeed, but it’s time to take a next step. Inbox your life. – Use multiple boards, so different projects don’t get mixed up together. So, why use several tools and channels to organize and prioritize your emails and tasks if you can just put it all together in one place? With the kanban system on your mailbox, everything will be clearer and easier. If you want to understand it better and have more examples on how to use it, head over here. Kanban works great for Gmail, all you need to do is start it out the right way. Get your inbox clean, delegate work, delete old messages and leave your inbox as a productivity machine you have never seen before. And we believe Drag is the right tool to make you and your business achieve so much more, so have a look at our features and check what we can do for your company.